India’s Most Wanted is the upcoming action thriller featuring Arjun Kapoor in the lead. The makers have unveiled the poster that features Arjun but it does not reveal his complete look. It his fierce eyes that draws all the attention towards him and with this partly obscured face, the curiosity to watch the teaser has just upped. The actor is playing the role of spy who is on a dangerous mission. India's Most Wanted New Look: Arjun Kapoor Looks Impressive as an Intelligence Officer. 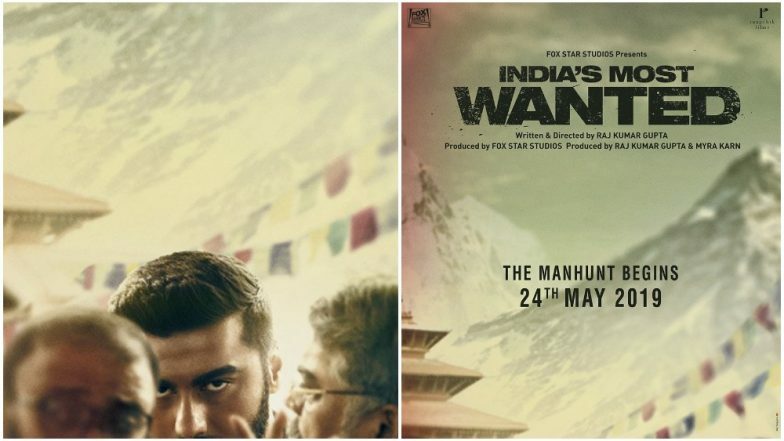 The poster of India’s Most Wanted also reveals the film’s release date, which is on May 24. While sharing the poster, the makers have also revealed that the teaser would be released tomorrow (April 16). While there were speculations that it would be latched with Kalank which is releasing on April 17, the makers have cleared the air. India's Most Wanted First Look: Arjun Kapoor's Intense Spy Avatar Will Pique Your Interest! The film produced by Fox Star Studios is directed by Raj Kumar Gupta. He’s the one who also directed No One Killed Jessica and Raid. This upcoming film is a story inspired by true events. Talking about it the filmmaker revealed to Mid-Day, “At a time when the audience is loving superhero films, my movie is about real heroes who save lives, and is set in the real world.” This film also stars Amrita Puri in the lead. Let’s wait and watch how the teaser of India’s Most Wanted manages to impress the audience. Stay tuned for further updates.